After a successful implementation of it free Wi-Fi internet service in India, Google is now targeting to bring it free internet project to Nigeria. The project which is aimed to afford over 10 million Nigerians with free internet data services is set to go into full bloom in 2019, with focus on five Nigeria cities. According to her, the free Wi-Fi will roll out in partnership with other Internet Service Provider with extensive fibre network, 21st Century, adding that the company was open to partnerships with other ISPs and telcos. Ehimuan-Chiazor said, “One of the challenges we found was access to data. Broadband penetration is low and are not reliable and there are challenges with affordability; just allow many Nigerians benefit from the digital economy. We are very excited to be able to launch in collaboration with partners. 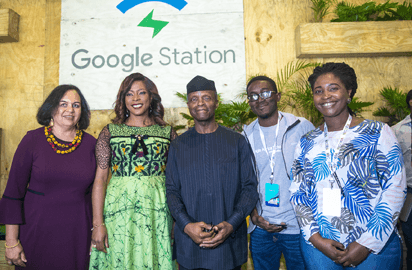 Commenting on the initiative, the Vice-President, Products Management, Google, Anjali Joshi, said the initiative would be scaled to other countries in Africa, although was not specific as to which African country would be the next, or when. Remember back in 2017, Google had introduced similar project in India, but was not totally accepted by the government of India. But commenting on these developments yesterday, the Vice President of Nigeria, Prof. Yemi Osinbajo, in his keynote address at the event, said the Federal Government was ready to support initiatives that were in line with the Information and Communications Technology road map of the country. As part of the commitment of the government to supporting technology development, he stated that an innovation centre would be unveiled at the Enterprise Development Centre of the Lagos Business School next week, a center which he describeed as being part of the commitment of the Federal Government to create an ecosystem for technology development in the country.